When you ask the question “does my pool need a heater” as a Florida resident, you may get some odd looks from those you ask, especially if they have lived further north. Florida is known for its gorgeous weather year-round, which some Northerners may think means that it is year-round swimming weather. However, most people, regardless of where they live, will agree that the outside temperature needs to be at least 70 degrees before they will think about leaping into a heated pool and closer to 80 degrees to jump into a non-heated pool. While Orlando remains above 45 degrees for more than 350 days of the year, nine months out of the year have days that drop below 70 degrees. To optimize your swimming time, a heater for your home pool is not out of the question! Reduce your need for pool care services. If you install a pool heater for your Florida pool you can actually reduce your need for professional pool care services. While a pool heater means that you will need to have your pool cleaned more weeks out of the year, you will be able to skip the opening and closing of your pool and allow your pool to operate without the fear of freezing. Living in Orlando, we get the best of both worlds, we get to enjoy our swimming pools when it is too chilly to splash about in the Atlantic ocean. However, there are a significant number of swimming days that are lost to cool weather or too cool water temperatures. Most people agree that the ideal water temperature for an enjoyable day of swimming is between 78 and 82 degrees. Any lower and dips the water will be shorter. In fact, spending more than 15 to 20 minutes in water that is less than 65 degrees can drop your body temperature and at temperatures less than 55, it can be dangerous to spend more than just a few minutes in the water. 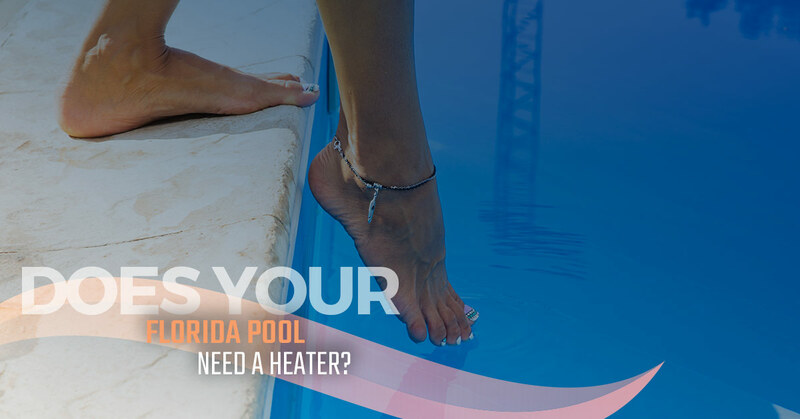 While it is true that for most of the spring and summer, the Florida sun may warm your pool water to a tolerable temperature, a pool heater can keep your pool at optimal swimming temperatures year round. You can always turn the heater off when the outside weather is consistently warm enough to sustain higher pool temperatures. Summertime is known for long days on the beach, playing in the sun. Summer parties tend to extend well into the night and if you’ve got a personal pool at home, you may find yourself as the host of most of these parties. Keep your pool party continuing well into the night when it is heated. As we mentioned earlier, when the ambient air temperature drops into the 70s, many people will feel uncomfortable swimming, and without the sun beating down on their skin, your guests will appreciate your pool heater. If you have considered a heater for your Florida pool, weigh the pros and cons for you. If you decide not to now, you can always change your mind and install one later. If you need help deciding, finding the right heater, or installing it, call a local reliable pool company near you. For professional pool care in Orlando, contact us at Florida Pool Care Pros today!